web security,web gateway,proxy,reverse proxy,caching,firewall,web gateway, antivirus,waf,web application firewall,load balancing,load balancpressor, a URL guarding facility, a Web load balancer, a WAF (Web Application Firewall), a traffic shaper, an SSL offloader & inspector. CacheGuard provides a firewall, an antivirus, a forwarding and reverse proxy cache, a web traffic compressor, a URL guarding facility, a Web application load balancer, a WAF (Web Application Firewall), a traffic shaper, a traffic logger and much more. Integrating CacheGuard into your networks is completely transparent for end users and Web applications. At the heart of CacheGuard there is CacheGuard-OS. To install CacheGuard-OS you need a dedicated hardware or virtual machine. Almost all hardware and virtualization systems in the market such as Dell, HP, IBM, VMware, Hyper-V, Proxmox Linux KVM and VirtualBox are supported. 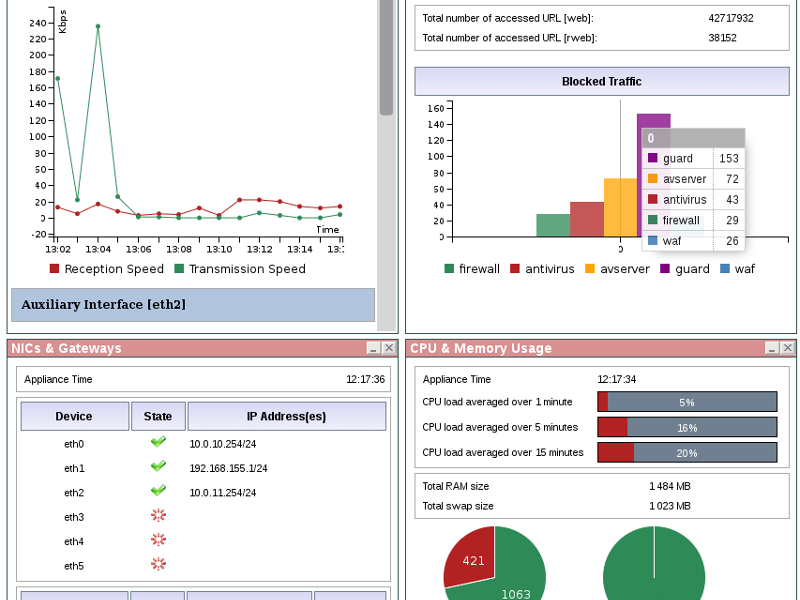 CacheGuard-OS is based on a hardened Linux system built from scratch (with LFS) and integrates Netfilter, IProute2, Squid, SquidGuard, Apache, modSecurity, ClamAV and many other open source technologies interfaced together as a whole to allow an easy and straightforward configuration process using a CLI (Command Line Interface) and a Web GUI.
. Integrating CacheGuard into your networks is completely transparent for end users and Web applications. Sys requirements: Dedicated x84/x64 based Hardware or Virtual Machine with at least 1.5 GB RAM, 16 GB HDD and 2xNIC.